Part of my project to read from the Man Booker Prize longlist. 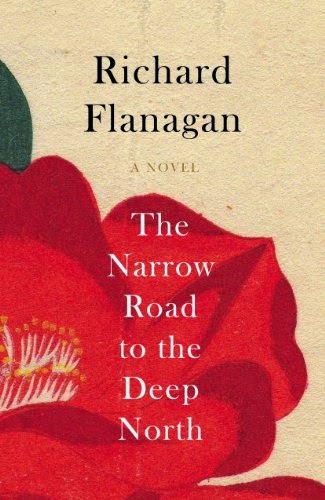 The Narrow Road to the Deep North tells the story of Dorrigo Evans, an Australian doctor who was the commanding officer of a group of Australian soldiers captured by the Japanese during the 2nd World War. At that time, the Japanese were determined to build a railway between Thailand (then Siam) and Burma. This had been rejected as an impossible endeavour by Britain and the US, but the Japanese were determined they would do it. Hundreds of thousands of Allied prisoners of war and slave workers from Asian countries were put to work clearing the jungle and building the railway, labouring increasingly long hours under conditions that started out brutal and only worsened as time passed. As a result, over 100,000 people died in the construction of what came to be called the "Death Railway". We know from the start that Dorrigo managed to survive, as we meet him as an old man, when he has become a highly respected war hero. The action jumps around from that point to Dorrigo's childhood, the prisoners working on the Death Railway, Dorrigo's doomed love affair with his uncle's wife right before the war, and what happened after the war. I had very different feelings about the different sections in the book. The sections set on the Death Railway were just brilliant. They were moving and illuminating. I recognised the truth in the characters. They felt real, even when their actions and emotions went places I had not expected and never considered, like when Flanagan wrote of what was going on in the Japanese prison guards' minds. It was harrowing to read, not just because of the violence and brutality and the graphic reality of just what it means to be worked and starved to death, but because of the bleakness of it all. But actually, I felt the whole point of the book was that bleakness, the realisation that there just wasn't a meaning to some things. Sometimes there isn't, and I felt the way Flanagan conveyed this was raw and powerful. I also particularly liked the sections exploring what happened after the war. We not only look at the prisoners but at the guards as well, and the hopelessness and bleakness continues there. Not everyone gets what they deserve, and in fact, some of the most vile characters escape all punishment and live quite happy lives, never even having to face their own sins. Those sections I discuss above affected me, hit me right in the stomach. I was close to tears pretty much constantly through several sections, and they spilled out a few times (when Darky Gardiner lost the sole of this boot, for instance, or during the scene at Nikitaris' Fish Restaurant after the war). Unfortunately, this is not all there was in the book. We also get a whole lot about Dorrigo and women... his forbidden love affair, his relationship with his wife, all the other women. And those sections just exasperated me. They were pretentious, predictable nonsense. The emotions never resonated with me or even felt remotely believable, and neither did the characters. Even the writing, which in the sections on the prisoners of war had a hypnotic quality and carried you forward like a wave, felt calculatedly "literary" in the worst ways. The adulterous love affair was probably the low point. The emotions in those sections evoked no recognition at all. They felt fake. This stuff sort of disappears at about a quarter of the way in, and really only comes back (a bit less heavily) in the last quarter, so for about half of the book, you get a glimpse of what the whole book should have been, and that was fantastic. So, definitely worth making the effort to read, but could have been so much better. I read Ron Charles' rapturous review in this week's Washington Post and I wondered how/when you would review this book. After reading both his review and yours, I suspect that I would feel like you re: the love life bits. Just so you know, if you didn't already--the author's father was one of those POWs working on the railroad. He says that the main character is NOT his father. Hi Barb, yes, an Australian friend send me an article in the Sidney Morning Herald where Flanagan talks about it and about writing the book: http://www.smh.com.au/entertainment/books/freeing-my-father-20130916-2ttiz.html You can see all of this (especially the guards) in the book. And that's one of the things I think make this worth reading, even if the bits about Dorrigo's love life don't work for you. It's not a perspective I've seen before. The most brilliant sections are a very tough read, though. If you do decide to read it, I'd love to hear what you think!